This is a rather unusual book, and one of several which Stephen Skinner has produced that reprints important earlier works or translations. Michael Psellus is a highly significant Byzantine scholar of the eleventh century CE, who wrote on a wide variety of topics (history, astrology, theology, and many others), and is responsible for transmitting a great deal of information on Graeco-Roman magic, religion, and philosophy. One of the most important works for which he is responsible is a commentary on the Chaldean Oracles (the original of which does not exist any longer), and some of the fragments of this text that he gives are uniquely found in his writings. 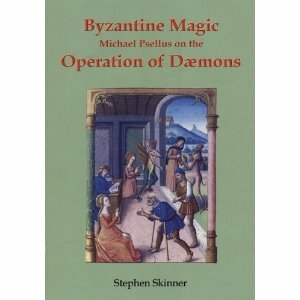 This particular work of Psellus, a dialogue on demons between “Timothy” and a “Thracian,” is one of his better-known works, and one which would have great appeal for modern ceremonial magic practitioners who are interested in the Goetia and other such works. However, Skinner provides an introduction, and some further footnotes in the text, but Marcus Collisson — a nineteenth century scholar and aspiring minister — actually edited and translated the text of Psellus, and provided an introductory preface to it. Collisson was possibly aided in his scholarship for this work by Sir Charles Nicholson, a classicist and the founder of Sydney University in Australia. Nicholson is the person to whom Collisson dedicated his original publication. While the volume is handsomely produced and presented (though not without a number of typographical errors), Skinner’s accomplishment in producing it, and the extravagant cover price (even though it is hardcover), are somewhat diminished because the work is not an up-to-date work of scholarship. It is useful and valuable, certainly, but I had hoped it would be better for the cost. Collisson’s introduction to the text is erudite and extremely useful, particularly in how it contextualizes how the ancient Greeks thought of daimones, not as malevolent beings as the Christians did, but essentially as a type of incorporeal spirits, somewhat similar to or even indistinguishable from gods, heroes, or even mortal souls. Short excerpts from the works of Plato, Plutarch, and others are given to illustrate this. Psellus’ text is the most interesting when it discusses (pp. 65-66ff) the typology of six varieties of demons: Leliurium or Igneous demons who occupy the sublunary upper atmosphere; the Aërial who occupy the same (lower) atmosphere as humans; Earthly; Aqueous or Marine; Subterranean; and the lowest which are called Lucifugus (“light-fleeing”). While Skinner’s introduction is useful for the insights it gives into the personages of Psellus, Nicholson, and Collisson, some of his notes in the translated text of Psellus are not as useful as they could have been, or are somewhat redundant and unnecessary when further parts of the text are consulted. Many are welcome illuminations, but others are rather obvious, or not very useful. I give two examples here from p. 71. “Phoebus” in the text is noted with “The sun god,” which most readers purchasing this volume would probably know. After a description in the text of how certain demonic knowledge came to one of the Thracian’s informants, a description that involves entheogens and visionary experiences, Skinner’s note reads “Similar to the shamanic experiences reported by Carlos Castaneda.” There are far more reliable and important sources on shamanic experiences than Castaneda, whose works are more fictional than anthropological, and thus not particularly relevant for attempting to ascertain if there is any veracity behind Psellus’ medieval Byzantine report of an African spiritual practice to the informant of his fictional Thracian character in his philosophical dialogue. Looking at it in any context closer to the medieval European, Greek, Egyptian, or wider African realms would have been far more useful and illuminating. Psellus’ text is rather brief, and had it not been for the two introductions and the footnotes, this already slim volume would have been even smaller. There is some demand these days for beautifully produced books, particularly amongst those who are serious magical practitioners. The codices produced by talismanic publishers like Scarlet Imprint or Waning Moon—particularly their limited edition volumes—are true feasts for the senses and the intellects of those who obtain them, and are well worth the rather high cover prices. I cannot quite say the same about this particular text. It is certainly useful to have a reprint of an important but not easily available medieval text that may have some relevance to modern magical practitioners; and with a further introduction by a modern authority, this would be even better. However, this choice of a rather fine edition, instead of a more accessible and affordable paperback format, greatly diminishes the possible consuming audience of this volume to collectors and bibliophiles almost exclusively. The text of Psellus is interesting and useful, but not quite as interesting or useful as this particular packaging would seem to suggest. A more sensible approach might have been to select several shorter texts by Psellus, even if they had been reprinted translations, and collecting them together, as opposed to isolating this one text and marketing it in this fashion. Even more desirable would be to produce a new translation, which actually translates all of the text — there are parts of Collisson’s translation and notes that are in untranslated Latin (which, note, is not the original language of the text! ; e.g. pp. 63-64, which is footnoted simply with “About the eating of excrement”), which was a common tactic by Victorian era scholars to not make such passages easily accessible to those not knowledgeable in the ancient languages. The work is not without value, by any means; but, it seems that a greater service to Psellus’ work and the continuation of his legacy would be better accomplished through a different means than reprinting a century-old translation.